A single engine Piper PA-28 Cherokee 9H-FLY with Oliver Bennett, David Polidano, Raymond Ebejer and Ezechiel Busuttil from the Malta Aviation Museum last month attended the fifth annual Historical Aircraft Group’s Fly Party for vintage aircraft at the airfield of Montagnana in the Veneto region, northern Italy. The local museum’s participation was made possible thanks to main sponsor Mediterranean Insurance Brokers and secondary sponsors Grand Hotel Excelsior, Sky People flying school, Euro Star Garage, Total oils, Mosta Radiators and Splash and Fun water park. 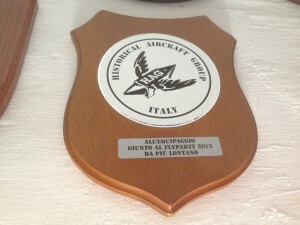 No fewer than 60 vintage aircraft took part, with the Maltese crew being awarded a memento for having travelled the greatest distance to attend the Fly Party. 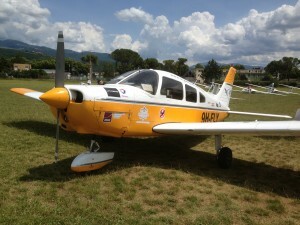 In its report, Warbirds News (www.warbirdsnews.com) described the two-day event, which hosted airplanes, gliders, helicopters, ultralights and aerobatic teams, as the premier event in the Italian air show season. It also hosted the first meeting devoted to airplanes designed by the legendary aeronautical engineer and aircraft designer, Stelio Frati. One of his notable planes was the Aermacchi SF.260, and there were four of them on display. During the flight demonstrations of the SF.260s, four planes suddenly fell together to perform a seemingly impromptu precision aerobatics display, carrying out a series of complicated steps and manoeuvres, wingtip to wingtip, garnering an enormous and enthusiastic response from the crowds below, who were not expecting much more than flyovers and some solo aerobatics. The mystery of the SF.260 display was solved when the planes landed and the pilots were revealed to be four former pilots of the Frecce Tricolori, the Italian Air Force’s aerobatic exhibition team. These pilots, now retired, clearly have not lost a taste for flying, nor an appreciable diminishment of their skills. 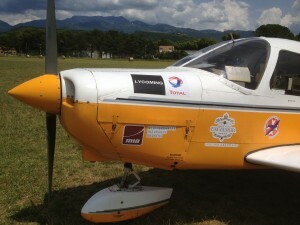 The success of this year’s event, the largest yet, was in large part due to the hard work of AvioClub Montagnana through its many volunteers and the tireless and efficient Vittorio Frison. The event director, Sergio Maron, serving as the announcer, was able to masterfully paint a compelling picture, describing the aircraft which flew during the show, bringing tangible emotion to the colourful commentary he provided for the planes, some of which he himself flew during his many years of service in the Italian Air Force. If you are interested in Events in Malta and would like information on Things to do in Malta during your holidays kindly contact the Concierge Team at one of the Leading Luxury Malta Hotels. This entry was posted in About Malta, Excelsior Hotel Malta, Malta, Malta Attractions, Malta Events, Malta Flights, Malta Sightseeing, Things to do in Malta and tagged air show, Avio Club Montagnana, events in malta, flight malta, grand hotel excelsior malta, luxury malta hotels, malta aviation museum, things to do in malta, warbirds on July 31, 2013 by Denise Camilleri. What comes to mind when you think of Malta during summer? Feast, food, fun, sun, holidays, relaxing, fireworks…. Oh the list is endless! It is widely known that during the summer months there is a feast almost every week. 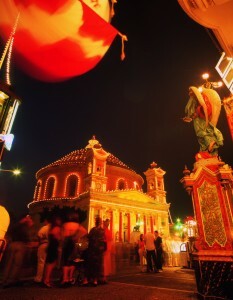 But one of the biggest feasts in Malta is that of Santa Maria which is celebrated on the 15th August. Several towns and villages around Malta celebrate Santa Maria, namely Mosta, Attard, Mqabba, Qrendi, Gudja, Ghaxaq and Victoria Gozo. Besides it is also a religious and public holiday in Malta so even the Maltese are out to celebrate. And if you happen to be in Malta enjoying a short break during the Santa Maria Weekend you can surely enjoy one of the Santa Marija feasts somewhere around the island. Be part of the festa fever; join the locals celebrating in the town or village square, enjoy the amazing fireworks displays, savour some of the traditional festa food, and witness children squeal with joy throwing confetti to one another as they follow the band marching after the local statue. • Complimentary pressing service during your stay. Should you wish to experience a typical Maltese Feast during your holidays in Malta contact the Concierge Desk at the Grand Hotel Excelsior and they will organise the excursion for you. And if you would like to enjoy a special summer break, stay at one of the superior Malta Hotels and enjoy a selection of superior Accommodation in Malta. This entry was posted in About Malta, Feasts in Malta, Holidays in Malta, Malta, Malta Attractions, Malta Events, Malta Feasts, Maltese Traditions and tagged accommodation in malta, fireworks, grand hotel excelsior malta, holidays, malta feasts, malta hotels, malta summer, maltese feast, Mdina, Mosta, pool, santa maria, seaviews, short break, summer on July 30, 2013 by Denise Camilleri. Does your country have any traditional dishes? Wondering what Slovakian Goulash is? When coming across people from different countries, a common question that one asks is ‘what’s a typical dish from your country’? Every country has its traditional food which it is renowned for. For instance in Malta one finds Stuffat tal-Fenek (rabbit stew), Braġioli (beef olives) and Lampuki Pie (fish pie). Other local snacks include hobz biz-zejt (round of bread dipped in olive oil, rubbed with ripe tomatoes and filled with a mix of tuna, onion, garlic, tomatoes and capers) and pastizzi (flaky pastry parcel filled with ricotta or mushy peas). We’ve asked our Sales & Marketing Trainee, Zuzana Sammut Jurcik, to share with us a typical dish found in her homeland. She mentions Goulash and explains that although Goulash is primarily a traditional Hungarian dish it has also become a popular dish amongst Slovakian people. 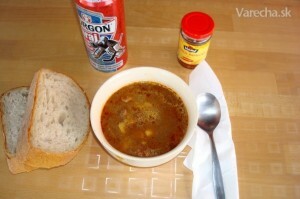 Goulash is a popular dish in Slovak homes and restaurants. However you will rarely find a dish that tastes exactly like the other. This varies not only by region but also from one family to another. We asked Zuzana for some secrets of what makes a Goulash meal so appetising. 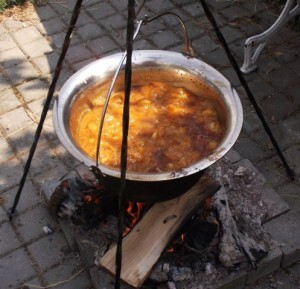 Although there are many different ways to make Gulas, her favourite way is to prepare it outdoors. She tells us that back home (in Slovakia) they call it Kotlíkový Guláš, which is popular at Slovak picnics as it’s cooked on an open fire. However she personally doesn’t think that cooking outdoors is a must. She encourages you to try cooking it in your own kitchen. Why not! And name it ‘Kotlikovy gulas cooked on the stove’! It is simple to cook, delicious and requires minimum preparation time. However, for all the flavours and tastes to come out, one should ensure that it is cooked very slowly for at least a good two hours. The basic version consists of onions, potatoes, water, herbs and spices, and meat – pork, beef, or venison. So let’s start with the preparations for a delicious Goulash meal! 370ml chopped peppers (different colours) and tomatoes. Marinade the meats by cutting the meat into cubes a day before, marinate and let it rest in the fridge till next day. Put the lard in the pot and add chopped onions. Braise slowly! Braise the meat slowly and keep adding some water. After approximately 1 hour add the pork and continue braising. Once the pork gets tender add the rest of the potatoes. Finally add some finely chopped garlic and marjoram. Once all the ingredients are added turn off the stove and let it rest. You can also add some chilli and spices according to ones’ preference. Did you enjoy our Goulash recipe? 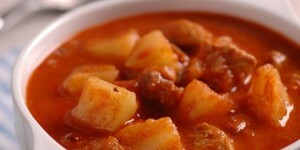 We’ve now challenged Our Kitchen Team to come up with a typical Maltese dish similar to Goulash. So check back soon for more updates!! And if you would like to try delicious and mouth-watering dishes book a table at one of the top Malta Restaurants at the Grand Hotel Excelsior and you will surely enjoy a 5 star dining experience. This entry was posted in Dining in Malta, Maltese Traditions, Outdoor Dining Malta and tagged dining in malta, goulash, grand hotel excelsior malta, Gulas, Kotlíkový Guláš, malta, malta restaurants, traditional dishes on July 24, 2013 by Denise Camilleri.